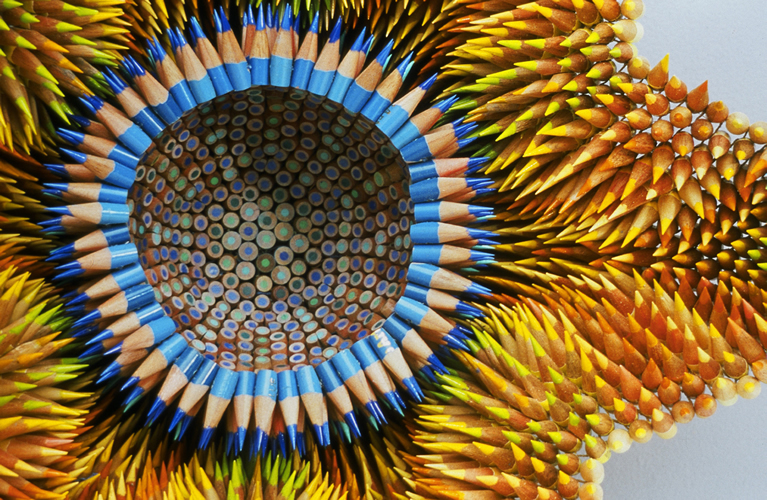 Jennifer Maestre’s unique sculptures caught our eye immediately. The object she relies on in her sculptures are coincidentally the main tool originally used to create the literary works we all love to read. Pencils! Colored ones at that! Even though the computer has diminished the pencil’s role, we can’t deny our roots. 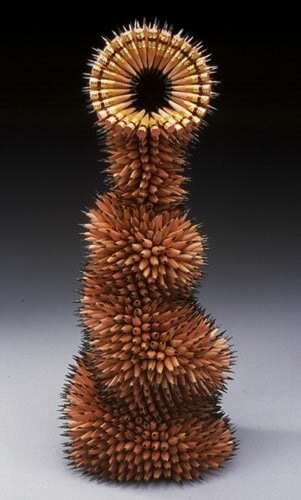 Jennifer re-purposes colored pencils, giving them new life as art…manipulating and combining them effortlessly into fascinating structures that are both menacingly sharp, yet able to encourage thoughtful contemplation. 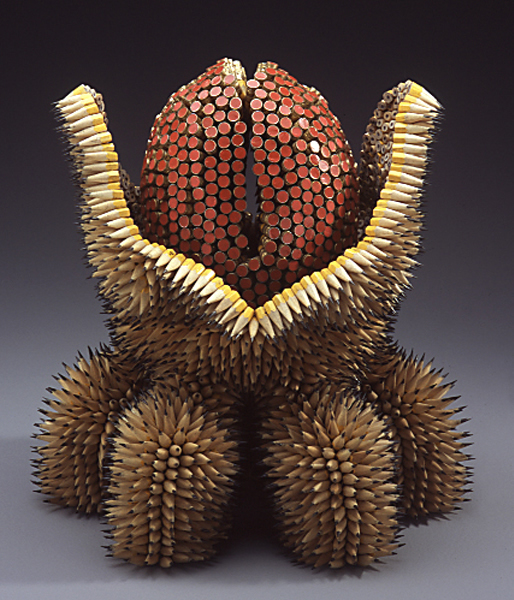 We are showcasing a Jennifer Maestre sculpture on our facebook cover art. Pif has the scoop on her background, her process, and her plans for future art. Emily Frankoski: What is your hometown and where do you currently live? 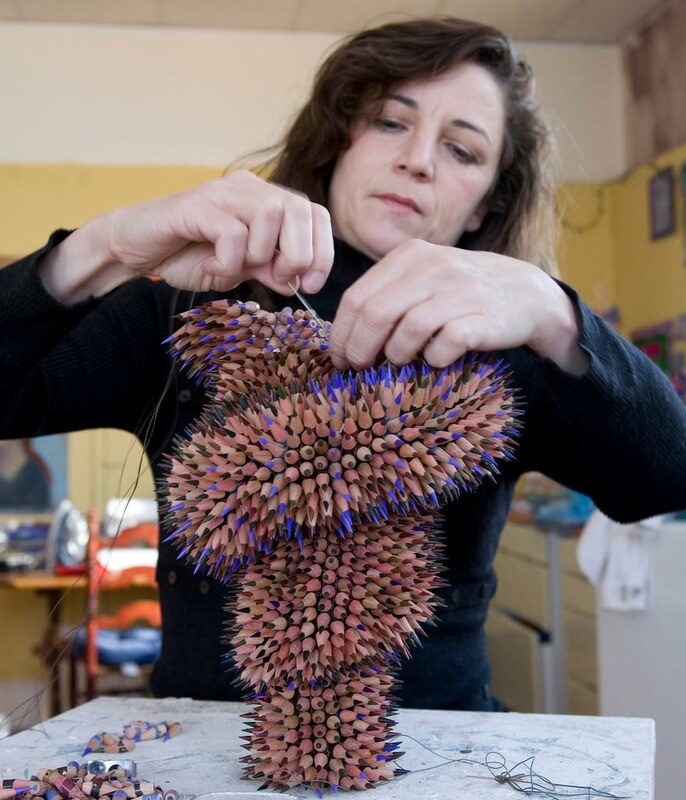 Jennifer Maestre: I currently live, and have a studio in Maynard, MA, USA. I don’t really have a hometown, since my family moved a lot when I was young. EF: How long have you been an artist and why did you start creating? JM: I think I’ve been an artist ever since I was a little kid. However, I would say that I didn’t decide to try and make a go of being an artist as my full time occupation until 1997, when I graduated from Mass College of Art. My mother was an artist, so I learned about Batik, painting, drawing, silk-screening, papier-mache, and other techniques when I was growing up. EF: What would you call your style and how would you describe it? JM: Haha, oh my. I don’t have a name for my style. It is repetitive, organic, and I guess, a little obsessive. Can I add playful, even though how that fits in with my above descriptions, I’m not really sure. EF: What inspires your creations? JM: At first, when I started these, I was inspired by sea urchins. Things have changed a bit since the beginning, and now I kind of riff off of what I have already done. There are so many variations that I think of when I’m working on a piece, so many new directions seem to open up. I put these ideas in my memory file for a future piece. Or, I look at the drawings of Ernst Haeckel, whose work I adore. EF: What is your background in art? JM: I went to Mass. Art in my 30s, and graduated as a Glass major in 1997. Before that, I was a Fine Art major at Wellesley College. EF: What do you plan to do next with your art/are you working on anything new? JM: I’m making jewelry and artist trading cards from pencils right now for my online shop, and some teapots out of pencils at the request of my gallery (Mobilia). As for the big things, I’m hoping to make a menagerie of crazy abstract animals. EF: Describe how you felt when you first decided to do art and how it makes you feel now. JM: I feel happy when I surprise myself (or my work surprises me). I felt that way when I started and I feel the same, still. Sometimes I look at my work and can’t even believe that I made that! EF: Do you sell your artwork and if-so, what is the price-range of your artwork? JM: The work that goes into galleries sells from $1,000 to $8,000. I do sell jewelry, ACEOs, and small sculptures on-line, and those price points are much lower: from $32 to $200. EF: If you had to pick one of your pieces that best describes who you are as an artist, which one would it be and why? EF: Consider the relationship between literature and art; sometimes great literature inspires art and sometimes great art inspires literature. Does literature ever serve as inspiration for your artwork? JM: My work is abstract, usually, so I’m not really influenced by literature in my imagery. I do have a recurring desire to make a sculpture based on the birth of Athena, but the closest I have managed to get so far is Aurora. I do use some mythological names for my titles. EF: Who is/are your favorite artist(s)? JM: Oh, so many. Odilon Redon, Henri Rousseau, Max Beckman. No, it is impossible to decide! EF: On average, how long does it take you to finish a piece? JM: I will just say, the longest was about two months. My hands get very tired and sore sometimes, so I can’t work hard hard every day. EF: In total, how many pencils do you think have been sacrificed for your artwork? And, what brand of colored pencils do you prefer? JM: I can’t even guess. If I had a dream pencil to use, it would be Faber Castell pencils, because they are beautiful. EF: Why did you choose to focus in on peyote stitch in your work? JM: I taught myself peyote stitch when, for a while, I was into beading. 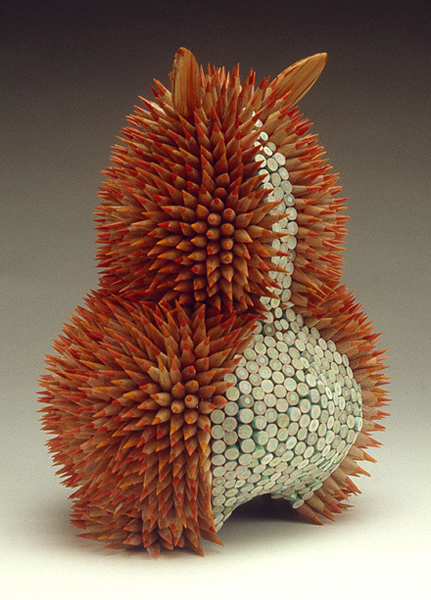 When I started making the pencil sculptures, it seemed like a good technique to attach the pencils together. It was an experiment. EF: What is the best piece of advice you have received? JM: Once your work gets out of your hands, you have no control over it. EF: What is your favorite piece of art (by someone other than yourself)? JM: Art I own? A bronze head that looks like brain coral and has sea shell eyes, by Joseph Wheelwright. JM: Ouch, I can’t pick just one, but here are a few. Sheltering Sky, Paul Bowles; Master and Margarita, Bulgakov; Augustus, John Williams.